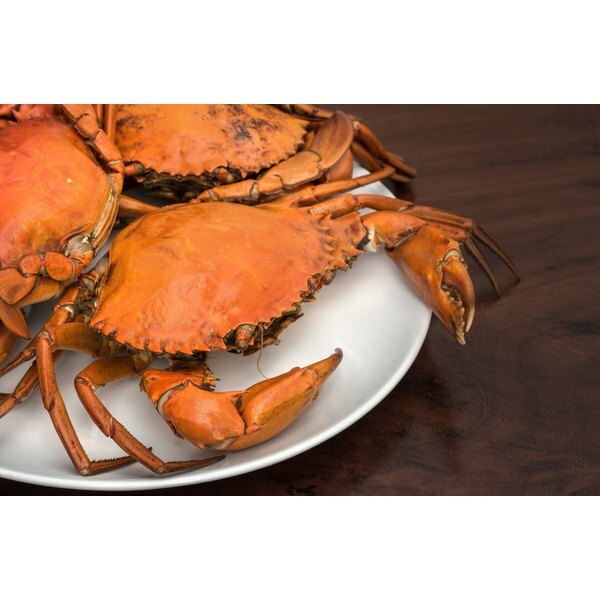 Crab meat, with its rich, sweet, buttery flavor, is a gustatory treat that offers substantial health benefits. Its mild taste makes it a versatile and satisfying ingredient in bisques, soups, casseroles and dips. Canned crab meat is a convenient way to enjoy this delectable seafood when fresh is not available. Canned Crab Meat has 119 Calories and 23.81 g of Protein per 100 gram serving according to the nutrition facts provided by the USDA Food Composition Database. Crabmeat is a high-protein, low-calorie and carbohydrate-free food. According to Blue Crab Info, a 3-oz. serving contains 17.17 g of protein, zero carbohydrates and a modest 86 calories (see References 1). Fit Day notes that although crab contains a small amount of fat, the fat is unsaturated, which is considered healthy. The website adds that crab meat is a natural source of omega-3 fatty acids, which can help reduce risk of heart attack and cancer, improve memory, and help stabilize mood. Crab meat is high in cholesterol, with a 3-oz. serving offering up 85 mg. According to the American Heart Association, you should limit your intake to under 300 mg if you have normal LDL levels. Crab is a good source of various antioxidant vitamins. According to Blue Crab Info, a 3-oz. serving contains 5.100 IU of vitamin A, 2.805 mg of vitamin C, and .850 mg of vitamin E . Crab meat is also an excellent source of vitamin B-12, characterized by Medline Plus as a water-soluble vitamin necessary for formation of red blood cells; a 3-oz. serving provides a whopping 6.205 mcg -- or 103 percent -- of the Recommended Value. Crab meat is rich in minerals. Blue Crab states that 3 oz. contains 18 percent of the RV of phosphorous -- essential for healthy bones and teeth -- 24 percent of the RV of zinc -- which helps to scavenge harmful free radicals -- and 27 percent of the RV of copper, essential in making red blood cells and collagen. According to Help With Cooking, 1 cup of crab meat also contains 57.9 mcg selenium. Crabmeat is rich in chromium, which helps to lower glucose levels in the body, states Diet Health Club. The website adds that hromium also helps to increase levels of HDL, or "good" cholesterol. This can in turn decrease your risk of strokes and cardiovascular disease. Although crab meat is a wholesome and nutritious food, observe some cautions when preparing and eating it. Obviously,if you have a shellfish or crab allergy, don't eat crab or any dishes containing it. Fit Day notes that the symptoms of a crab allergy can range from a mild rash to a life-threatening anaphylactic reaction. If you experience swelling of the lips or throat, difficulty breathing, hives, wheezing or faintness and confusion after eating crab meat, seek emergency medical attention. Crab meat also contains moderately large levels of purines, which can trigger attacks of gout in some individuals. What is the RDA for Vitamin B-6? What Is the RDA for Vitamin B Complex?